Political cartoonists from India and around the world received some well-deserved recognition last week with the announcement of the winners in this year’s Maya Kamath Memorial Awards from the Indian Institute of Cartooning. While all of the designees reflect a certain provocativeness that is the very nature of the medium, two in particular focussed on recent battles over free expression. 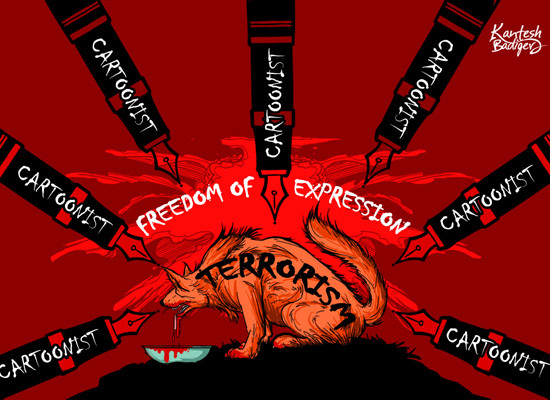 Second prize overall went to a cartoon by Kantesh Badiger of Bangalore, India, who commented on the Charlie Hebdo attack and other threats faced by cartoonists by depicting terrorism as a slavering wolf contained within a prison of pens. Badiger is a freelance cartoonist who mainly shares his cartoons via his Facebook page and the Indian website Kannada Circle. 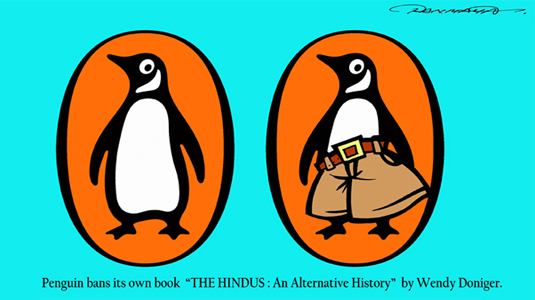 One of the Special Jury Appreciation prizes went to Tanmaya Tyagi for his cartoon that slyly lampooned Penguin Books India’s decision last year to withdraw a book from publication because some Hindus said it was offensive to their religious tradition. Tyagi’s cartoon put pants on Penguin’s famous logo, suggesting that the publisher might need to take further steps to avoid offending anyone. Tyagi lives in New Delhi and works for the investigative news magazine Tehelka, but the winning cartoon came from a 2014 in Review series that he contributed to The Citizen. Tyagi also shares much of his work on his Facebook page. The competition is named for Maya Kamath, a beloved Indian cartoonist who published in a variety of periodicals from 1985 until her death from cancer in 2001. Her cartoons often focussed on women’s rights, government corruption, economic inequality, and environmental pollution. Her family established the annual awards in 2011 in conjunction with the Indian Institute of Cartooning. Congrats to all of this year’s winners! Check them out over here.